Osteo-D injectable solution: Each 1 ml ampoule contains Colecalciferol BP (as Vitamin D3) 200000 IU. Osteo-D oral solution: Each 1 ml oral solution contains Colecalciferol BP (as Vitamin D3) 5 mcg (200 IU). 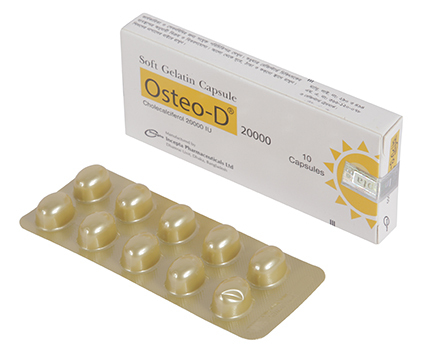 Osteo-D 20000 IU soft gelatin capsule: Each soft gelatin capsule contains Cholecalciferol BP (as Vitamin D3) 20000 IU. 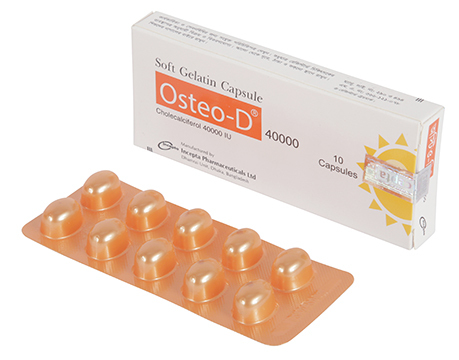 Osteo-D 40000 IU soft gelatin capsule: Each soft gelatin capsule contains Cholecalciferol BP (as Vitamin D3) 40000 IU. Vitamin D is essential for normal bone growth and development and to maintain bone density. It is also necessary for utilization of both Calcium and Phosphorus. Vitamin D acts as a hormone and increases reabsorption of Calcium and Phosphorus by the kidneys and increased bone turnover. Breastfed infants who are not exposed to sunlight are unlikely to obtain adequate amounts of vitamin D from breast milk to satisfy their needs beyond early infancy because the vitamin D content of human milk is low (1-10 IU/250 mL). The vitamin D available to the infant during the first 6 months of life depends initially on the vitamin D status of the mother during pregnancy and later on the infant\\\\\\\\\\\\\\\'s diet and exposure to sunlight. Vitamin D deficiency can result in rickets, a painful disease characterized by a softening of the bones and the growth plates. Dietary vitamin D is therefore recommended to correct for a lack of exposure to ultraviolet light fulfilling the required amount of Vitamin D.
Also, while the importance of vitamin D in infancy has been focused on protection from rickets, emerging research suggests that optimal vitamin D status may play a role in the protection against the development of other diseases. Vitamin D is also important for the normal growth of the children and it helps to prevent rickets. Colecalciferol (Vitamin D3) is recommended 5-10 mcg or 1-2ml (200-400 IU)/day or as directed by the physician. Cholecalciferol (Vitamin D3) is recommended 100 IU (1 tablet) daily, or as directed by physician. Take the medicine with food or within 1 hour after a meal. Place the tablet in mouth swallow after chewing. Treatment of Vitamin D deficiency: 40000 IU/week for 7 weeks, followed by maintenance therapy 1000 IU/day. Prevention of vitamin D deficiency: 20000 IU/Month. Treatment of Vitamin D deficiency, 12-18 years: 20000 IU, once every 2 weeks for 6 weeks. Generally all nutritional supplements are considered to be safe and well tolerable. However, few side-effects can generally occur including hypercalcaemia syndrome or Calcium intoxication (depending on the severity and duration of hypercalcaemia), occasional acute symptoms include anorexia, headache, nausea, vomiting, abdominal pain or stomach ache and constipation with the administration of Colecaciferol. insufficient vitamin D and calcium intake), the body activates the parathyroid gland, which produces PTH (parathyroid hormone). This hormone kick starts vitamin D hormone production and assists removal of Calcium from the bones to be used in more important functions such as neutralizing body acidity. There is no evidence to suggest that vitamin D is teratogenic in humans even at very high doses. Colecalciferol should be used during pregnancy only if the benefits outweigh the potential risk to the fetus. It should be assumed that exogenous Cholecalciferol passes into the breast milk. In view of the potential for hypercalcaemia in the mother and for adverse reactions from Cholecalciferol in nursing infants, mothers may breastfeed while taking Cholecalciferol, provided that the serum Calcium levels of the mother and infant are monitored. It should be assumed that exogenous Colecalciferol passes into the breast milk. In view of the potential for hypercalcaemia in the mother and for adverse reactions from Colecalciferol in nursing infants, mothers may breastfeed while taking Colecalciferol, provided that the serum Calcium levels of the mother and infant are monitored.